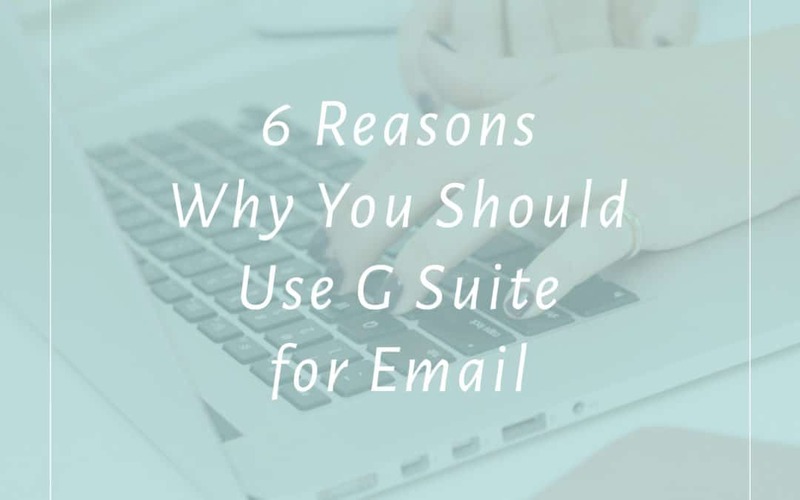 When setting up email marketing for clients, one of the most important suggestions I make is for people to sign up for a G Suite account. If you’re in business, having a reliable email service is a cornerstone and worth investing a little bit of money and time in setting up. Email is the lifeblood of online business and you don’t want to cut corners here. Sure you could get by with something else for awhile, but it’s better to start strong and organized than to have to deal with switching over later. Many of my clients have asked why I’m so fanatic about this, so I thought I’d combine the answers I’ve given them over the years and create a resource that will help you if you’re not sure about making the leap to G Suite. Nothing screams “I don’t value my business” like having an email address like “crazycatlady88@yahoo.com”. And while “mybusiness@gmail.com” or “first.last@gmail.com” is a step in the right direction, it still reads “I don’t take my business seriously.” If you want to give a professional first impression, an email like “info@mybusiness.com” is a great place to start. Bonus: The Oatmeal put out a great comic about what your email address says about you: Check it out here. Your web host should not be your email host! Now that you realize you need a domain-based email, you’re probably realizing your web hosting account came with one, you just never bothered to set it up. While that is an option, and it is better than clinging to your old Hotmail account, I would caution you against this. First, it’s not the simplest solution when you like to read your emails from multiple devices, but more on that later. Second, if your site goes down, your email goes down, too. That’s not ideal if you don’t want your customers (or readers) thinking you’ve fallen off the face of the earth. Sure, your hosting may have great uptime, but things happen that are beyond anyone’s control and I wouldn’t put my eggs all in one basket. Your emails are more likely to make it into other people’s inboxes. Some email sending services won’t even let you sign up for their platform without a domain-based email (like ConvertKit), while others do, but warn you that you may have deliverability issues (like MailChimp). See, it goes like this: your bulk emails sent from your @yahoo.com account make their way to your customer’s email server. That server throws up a red flag claiming you’re spam because it knows that that address shouldn’t be sending bulk emails. The more this happens, the fewer inboxes you land in. Without a domain-based email, you’ll land in more spam folders than inboxes. You also won’t be dealing with the dreaded blacklisted IPs that are common when using your web host’s email system. In business, there are few things worse than realizing you never got that really important client email because your inbox was full. With G Suite, you have 30GB of space, and that’s pretty hard to fill. In 3.5 years, 15 different email addresses for 4 different businesses, my main account is hovering around 30% of my storage used, and I never delete anything, just archive it all. I mentioned this briefly before, but G Suite runs with the same simplicity as your good ol’ Gmail account. Apps galore, and works seamlessly even with iOS (trust me, I’m an Apple girl). And bonus, it’s easy to have your personal @gmail tagging along in the app right next to your domain-based email. And that goes for all of the other pieces like Google Cal and Drive, too! No more messing with IMAP or SMTP settings to get your email on your device or having to go back and delete or file things in two places because of a hiccup. Aliases, filters, and organization–oh my! G Suite offers an amazing amount of options for organizing your inbox. From their own tabs system to the ability to use filters, aliases, and labels, there’s no excuse for a messy inbox. You can manage multiple email addresses in one place, automatically add labels for messages you receive often, and even filter all of your newsletters away from your inbox so they’re there when you want them, but not suffocating your client messages. And if that’s not enough, there are many tools to take your organization even deeper like Labs, Boomerang, and Sortd. I have a very simplistic view of running a business and don’t believe in having any more subscriptions or accounts than absolutely necessary. But after years of running businesses online and feeling overwhelmed by my inbox, I can say that G Suite is worth every penny. For one user, it’s a mere $5/month, and an additional $5/month for each user you add. Keep in mind, that’s per user, not per email address. So if you’re a solopreneur who wants to have name@business.com, sales@business.com, and clients@business.com all funneling into your inbox, then you’re still looking at just a single user. You can sign up for a free 14-Day trial of G Suite here. You can use these coupon codes for 20% your first year – MA4WAVA4L9QX9GT (for the G Suite Basic Plan) or W7XPREGEFUAKG7L (for the G Suite Business Plan). And I made a thorough video tutorial on setting up your G Suite account, complete with establishing aliases and filters to keep your inbox organized. You can watch it by clicking here.